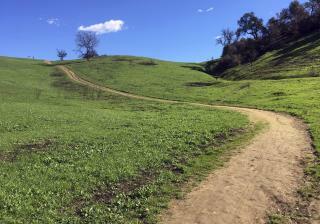 (Newser) – Thanks to a very wet winter, California is finally drought-free. A map released Thursday by the US Drought Monitor shows "almost entirely normal conditions" across the state for the first time since December 2011, reports the Los Angeles Times. "It's been so wet … that we've been able to alleviate drought across the state," says climate scientist Jessica Blunden. Many of California's reservoirs were filled by storms in January, when the snowpack in the Sierra Nevada doubled. The snowpack, a major source of water for the state, then doubled again in February. Now, "the reservoirs are full, lakes are full, the streams are flowing, there's tons of snow," and "all the drought is officially gone," Blunden says.